LAFAYETTE, La. 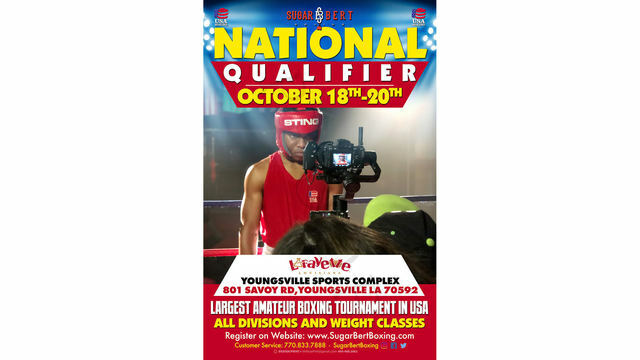 - Lafayette Parish will play host to the Sugar Bert Boxing National Championship Qualifier, Oct. 18-20, 2019, at the Youngsville Sports Complex. This three-day national amateur boxing tournament is sanctioned by USA Boxing and is a qualifier for the Sugar Bert National Championships. Winners in certain weight classes will also be eligible for USA Boxing Olympic Trials. This family-friendly event will bring more than 1,500 people from all over the U.S. to Lafayette Parish and has a potential economic impact of more than $500,000 dollars. “When LAGCOE announced they were moving to New Orleans, I said we would pull up our boot straps and get to work on replacing the lost business; and when we hosted the National Golden Gloves in 2017, I said that the prestige of hosting such a large event would pay off down the road because people would be paying attention. With the announcement that the Sugar Bert Boxing National Championship Qualifier will be coming to Lafayette Parish October 18-21, I’m excited to say that both of those statements are happening. Our sales team, led by Chief Sales Officer Mike Roebuck, have done a great job of identifying and locking this event down. I want to thank Youngsville Mayor Ken Ritter for working with us to make the Youngsville Sports Complex available. This event would not be happening without the complex and their support. I also want to thank Mayor-President Joel Robideaux for his and the CREATE initiatives support as yet another great example of how we have been able to leverage resources. Finally, we thank Bert Wells for bringing this event here for what we hope will be a long- standing relationship.” Ben Berthelot, President and CEO of Lafayette Travel. “For the last four years, we have taken Sugar Bert boxing to some of the largest cities and best venues around the country. When we visited Lafayette, the culture spoke volumes to me and we knew it would also appeal to the diverse multitude of boxers we will be bringing to the area. We look forward to a large turnout at Youngsville Sports Complex this year and our goal is to ultimately grow this event over the next several years, creating a large economic impact for Lafayette Parish.” Bert Wells, Sugar Bert Boxing.